How to run the hot water piping? 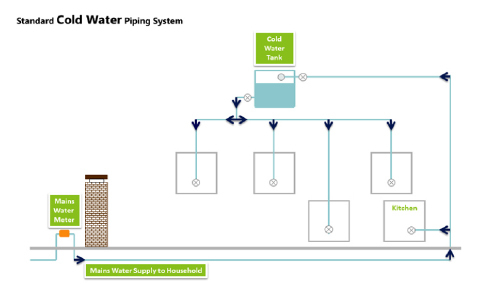 Usually the developer will provide you the cold water piping as you see from the graph “Standard Cold Water Piping System”. So, what should you do if you would like to install a solar water heater? 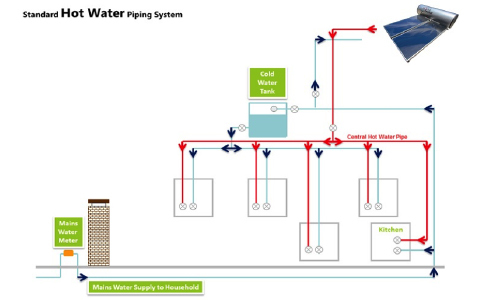 Herewith the second picture “standard hot water piping system. You will need to conceal a hot water piping into your house (wall), it is either copper pipes, stainless steel pipes, PPR pipes or PA pipes. 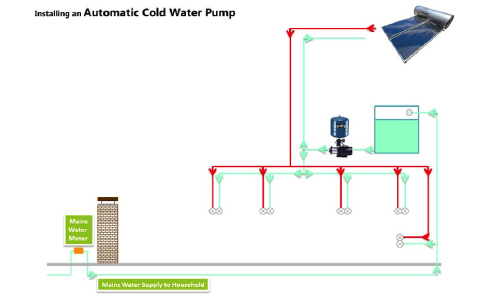 From “standard hot water piping system you can saw the water is directly runs to the solar water heater through cold pipes (inlet), and come out to the hot water pipes (outlet) and distribute to bathrooms and kitchens. For some houses the water pressure is not strong enough, especially if you are going to install a rain shower head which sized more than 8”, we are mostly recommend you to install a water pressure pump to increase both hot and cold water’s pressure for whole house.